As a result of the discussion of the "Three Foot Deep" hoard here and elsewhere, a series of photos is now going the rounds of the blogs and forums which purports to show the "real" story of how English metal detectorists Barrie Plasom and Dave Phillips dug out the 1400 Late Roman bronze coins from a Roman site on the Bedfordshire/ Buckinghamshire border. The implication is that either at the Coroner's inquest the true details of the discovery were not given by the finders, or the reporter misheard and wrote a load of rubbish. The photos are being promoted by Norwegian metal detectorist and metal detector promotion film-maker Gary Brun. They show a nice neat hole being dug by a young gentleman who actually is Julian Watters of Verulamium Museum, the Finds Liaison Officer for Bedfordshire and Hertfordshire (we remember the hoard in question is in Buckinghamshire). The hole is nowhere near "three feet deep", and no pot or coins are visible. Certainly if I was excavating a site of plough-scattered coin hoard which is supposed to go down a metre, I would not be opening such a small trench ! Something here does not tally. The photos have come from the website of Central Searchers, an enigmatic metal detecting club. They are not accompanied by any text, all it says is "Buckingham Hoard Excavation" (Buckingham of course is not on the Bucks/ Bedfs county border). I tried to register on the Central Searchers forum to see if there was there any backround information there why Mr Brun might think that this "Buckingham Hoard" was the same as the December 2006 one discussed at the coroner's inquest. Sadly, Central Searchers obviously have something to hide (they apparently do not support either official Codes of Practice for metal detecting nor do they include a link to the PAS on their website) and they deleted my account immediately. I think there is much more to the smoke and mirrors that are beginning to surround this story than might be apparent. Watch this space. This case is interesting as it shows the realities which lie behind the actual operation of the English Treasure process so facilely proposed by the pro-collecting lobby as a "model to be imitated" in other countries. Here the secrecy and lack of openness once again hinder any kind of appreciation of what lies behind the bland labels of treasure hunters as the "unsung heroes of the British heritage". Cultural Property Observer ("Reported Treasure Find Prompts Catcalls Rather Than Congratulations") thinks that we should be profusely thanking metal detector users that obey the law in England and Wales. This is the law concerning reporting to an agent of the Crown discoveries of items falling under the UK’s 1996 Treasure Act. * Among the people I think by the same token we owe a debt of thanks to are all those bus drivers who obey the Highway Code, politicians and civil servants that do not expect bribes for doing their job, gun-owners that don’t shoot at passers-by and all those teachers out there that do not seduce their under-age pupils. I think we should also thank all "metal detectorists" for not dismantling iron park railings to sell for scrap. So here's a “thanks” to those two heroic metal detectorists we read about in the newspaper report for lying on the cold ground hoiking out all those coins from well below plough level apparently in a manner which means we do not have to worry about working out anything about how they were deposited there. True, the PAS has spent millions of pounds of everybody’s money trying to persuade people like them to do things differently; true that the Treasure Act Code of Practice says that something different should have happened for these guys to get the full reward. But these surely are minor details aren’t they? Let’s not let a little thing like that get in the way of fullsome praise. After all those coins have got “Fel temp Reparatio” written on them, so it must be a good thing, eh? When those coins were minted, everything seems to suggest that the Roman economy in Britain was functioning much as it had for the last three hundred years. Within two decades, it was not. There were severe disruptions which within 60 years of the reform they signal led to the total collapse for most of the British Isles of a whole lifestyle. Gone. The written sources tell us next to nothing about this period in Britain. The numismatic evidence likewise; all we see is a faltering of the small change economy, increasing hoarding of high value coins, and then…. Nothing. If we are to understand this period at all (and I must confess its one of my favourites) then it will only be through the archaeological evidence, but not loose contextless artefacts like Quoit-brooch style metalwork and “military buckles” or loose coins hoiked out of the ground by metal detectorists, but careful and painstaking excavation of shallow and difficult sites like Wroxeter. It is however the deposition patterns of metal objects like those hunted down and taken away from these shallow sites by metal detector using portable antiquity collectors that are often the only way to date the deposits concerned. Damaging these sites simply removes any possibility we and future generations will have of even trying to understand what happened in the last decades of the difficult fourth century in Britain. So, no, lets not "thank" any metal detectorists who bodge the job, ignore the Codes of Practice and destroy through their haste what could be important evidence. Let’s thank the ones that listen to the “outreach” that in Britain they’ve been spending a lot of time, money and effort trying to persuade them to do a bit of “giving” with their “taking”. Let us not thank people for merely obeying the few laws that do regulate this activity, let us reserve our praise for those that actively apply the principles of "best practice". What the newspaper report of the Treasure inquest tells us happened in that dark field that December night would not be even 'almost good-enough' practice. But then, as anyone from outside can observe, notions of best practice in the antiquities collecting world as a whole do tend to be a bit "fuzzy". I would like to drew Cultural Property Observer's attention to the fact that this is MY blog and not that of any “SAFE”. The views here are my own, not theirs. Vignette: a "happy days" coin. * A lawyer should know the difference between the Treasure Act 1996 (England, Wales and Northern Ireland) and the law of Treasure Trove (Scotland). Newport Pagnell is not in Scotland. Hmm. I do not know how it is on the metal detecting scene in Washington, but in England most metal detect users try hard by various forms of “research” to locate a “productive” site to search. The British weather is pretty miserable most of the time (most of the detecting season in particular) and spending hours on end in the drizzle sweeping an area which produces nothing and is never likely to produce anything really is not exactly going to be regarded by anyone with a modicum of intelligence as a very fruitful pastime. For this reason, many metal detected finds do not come from fields which contain no other evidence of human activity. Maybe Washington DC detector users might like to learn for example a few tips from English metal detector users where to find Roman finds... (Finding Roman Sites - Help for Newbies, by "Bathdigger"). Some magical significance seems to be associated by US coin collectors to the words "found in ploughed fields". They seem to have in their heads the idea that anything that is in a ploughed field is not from an archaeological site. Perhaps they think it just fell there out of the sky? Or was "dropped on the way to a battle". I think they must imagine that all ancient sites in the UK apart from Stonehenge must be concreted over by now. I don't know what they'd think of major Roman sites like Durobrivae, Wroxeter, St Albans, Shore Forts such as Othona and so on... all lying in and under ploughed fields. the fact that the coins were found with broken pottery (presumably the remains of the container that initially protected the coins) still argues that earlier ploughing operations already damaged the context of the find. This of course, as well as the date when it happened was one of the things that a proper investigation of the findspot instead of the nocturnal fossicking that took place could have revealed. An episode of (for example) Dark Age ploughing would be just as much part of the context (story of the findspot) as the deposition of the hoard. Or maybe the jar was broken to get part of the hoard out a few years after it was hidden? Or to add a second batch of coins? We will never know because the nocturnal coin grabbing probably simply mixed the whole lot up. This find was not from ploughsoil, it was most likely removed from (comprised in fact part of) undisturbed - and most likely largely unthreatened - archaeological deposits lying below it. That is the archaeological reality behind a few thousand more Late Roman bronzes entering the "numismatic" market which is already saturated with them. Cultural Property Observer discussed two blog posts (mine and David Gill’s) about the three-foot deep hole apparently dug in the dark by English metal detectorists on a Roman site at Cold Brayfield near Newport Pagnell and says “I find all their focus on context in this circumstance to be a bit laughable.” Well, he would, it has already been adequately shown out by David Gill that this US lawyer's notions on archaeological context are somewhat uninformed. Tompa, amazingly, cites Roger Bland, director of the Portable Antiquities Scheme in support of his mocking tone. In the light of CPO's comments I’d also be very interested to hear what Roger Bland has actually said to the US coin collectors and dealers of the ACCG and Unidroit-L who seem to have a very warped idea of what the PAS actually does and represents. For the PAS is nothing if it is not about context ! This raises the question of what the PAS would say to these two metal detector users had they asked if it was OK to dig a three foot hole in the dark into a Roman site. Would they say “no, this is a bad idea”, or would PAS staff stay silent so as not to upset the inherently touchy and defensive metal detectorists? Well, gentle reader you will just have to log on to a metal detecting forum on which a number of archaeologists as well as Roger Bland himself are members to find out what weighty ethical matters they discuss as part of their outreach with British "metal detectorists" and how frequently. After all, what better place to reach these people than an online forum? (More to the point, have a look at the number of issues that came up over that year that they decided not to pass comment on.) I think though the notions of archaeological outreach conducted by the PAS and other "bridge-building" archaeologists have up to now tended to concentrate more on reaching out for "data" than reaching out with archaeological advice. More passive taking than active giving here too, I get the feeling. The same thing was happening on the PAS Forum when they had one. I think we'd all like to know what the PAS would actually say as part of their outreach to other “metal detectorists” contemplating imitating the reported deed. The newspaper report of the findings of the Milton Keynes Treasure inquest gives us all the impression these guys are being rewarded for what sounds like bad practice, if this is not the case, I assume the PAS will be producing a statement setting the record straight. Last Sunday, according to AFP, Lebanese customs officials on the Syrian-Lebanese border seized 57 Iraqi artifacts and arrested two smugglers, a Syrian and an Iraqi. The objects were hidden in a vehicle trying to cross into Lebanon at Masnaa crossing post just east of Damascus. After seizing the archaeological artefacts found in the vehicle, customs officers raided a house (presumably in Lebanon) and reportedly found more illicitly removed antiques. The artefacts seized at the border crossing included statues, pottery and engraved stone pieces destined for the global no-questions- asked market in such antiquities. Photographs taken by Joanne Farchakh Bajjaly were published on Ancient World Bloggers Group and their state strongly suggests that they were items cherry-picked from a much larger assemblage of artefacts – where are the broken bits recovered by the looters from their deep diggings into the archaeological record? New Zealander oriental antiquities collector Kenneth Blair reckons I've got it all wrong about the significance of the ivory ban, so wrong in fact he has cross posted this information not only on the ancient artifacts Forum, but also (for reasons that are beyond me) to the antiquitists' plodding happy-slapping Unidroit-L. Well, Mr Blair obviously has not read what I wrote nor thought too deeply about it, so I'm not really too bothered to discuss it with him in detail. If you read what he wrote, its the same old mantras, the same old personal comments rustled up in defence of a bunch of attitudes which are increasingly obviously becoming indefensible. It's odd isn't it that the antiquities trade is said some of the time by collectors and dealers to act like any other supply and demand market... until that is supply and demand arguments are used to criticise it. Then we are told that of course we "simply do not understand" how this mysterious market works, it's not like a normal supply and demand market. Well, there certainly is a LOT of secrecy about and this lack of transparency hinders determining its workings - but the areas that dealers and collectors keep most quiet about are of course rather telling in themselves, I think in reality most observers have a pretty good idea what it is they are trying to hide and trying to deny. The parallel with the trade in illicit and mis-provenenced ivory is too close for comfort I guess. The point is that ebay's ivory ban IS in response to a demand. The demand from decent conservation minded and concerned people that, in order that its reputation is not further tarnished, eBay do something about the way it is currently apparently being used to disseminate misprovenanced ivory goods which has the potential of being used as a cover for the sale of illicitly-obtained material. Despite the ban, nobody is in any doubt that some nasty, thoughtless and self-centred people will still continue to buy and sell their sliced up bits of freshly slaughtered elephant, but not on ebay alongside decent people. There will be less ambiguity about who they are and precisely what they are doing. EBay realises that decent normal folk will not want want to mix with them, and do not want the reputation of a place where "elephant killing by keystrokes" happens. Perhaps it is time for them to likewise sort out some of the other controversial areas such as their involvement in the trade in poorly-provenanced and fake antiquities which also heavily tarnishes its corporate reputation. Vignette: taotie mask from the type of Chinese bronze terribly popular with collectors. A huge dumping ground for the destroyed remains of Jewish property plundered during Kristallnacht has been found in Brandenburg north of Berlin by Yaron Svoray, an investigative journalist. The site, the size of four football pitches, contains an extensive array of personal and ceremonial items looted during orchestrated nationwide riots against Jewish property and places of worship on the night of November 9 1938. Svoray is worried about making his find public because the site might attract far-right treasure hunters. "There's no treasure as such here, but there's still the danger of it turning into some skinhead circus eBay special," he said, urging the government to secure the site. For the past few days, conservation blogs and news have been full of stories that from the beginning of 2009, eBay will ban all sales of items made of elephant ivory - Yielding to Conservationists, eBay Will Ban Ivory Sales. 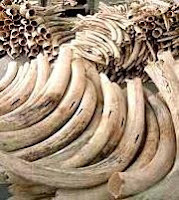 Lobbyists had been campaigning for the closure of the loopholes that de facto had existed in the existing regulation of the ivory trade, and unregulated internet sales were one of the biggest. This is a victory for the conservation lobbyists who have been pointing out that it is the inability of buyers (and here US ones figured largely) to curb their acquisitiveness and ask where the raw material was coming from which has been directly responsible for the continued poaching of elephants in the wild, even in places where they are supposed to be protected. Good profits are still involved because despite existing bans there is still an unquestioning market for ivory, as a result elephants are being gunned down even in wildlife reserves, despite the presence there of armed rangers and other measures taken to protect them. I wrote on this depressing situation earlier and reflected on its relationship to the antiquities trade. This is an interesting parallel to the antiquities market in several ways. First of all the current situation is a foil to the arguments of portable antiquity collectors that "it is not they who are responsible for looting", but the archaeologists who “do not guard sites against the looters”, or the laws "are ineffective". It is clear that in the case of ivory, the market and therefore the incentive for poaching exist because there are people willing to buy ivory goods no-questions-asked. Here internet-aided sales have a large influence. Conservation groups detail how much ivory they found being traded in the US alone through sites like eBay. They labeled it “Killing by Keystrokes” which is an interesting parallel to Elias’ “Collectors are the real Looters” epigram referring to portable antiquities. It is the same with document-less antiquities. There in an incentive for people to go out with spades and metal detectors to dig up little scraps of the past from a local archaeological site while there are acquisitive people who are willing to buy them. In the case of ivory, EBay faced with the criticisms of a whole bunch of animal rights and nature conservation groups has decided to do its bit to protect the elephant (and also of course its corporate image). Good for them, one can only applaud this decision and hope it will do its bit to curb the disgusting killing to give a few selfish individuals the hedonistic but perverted pleasure of owning a piece of dismembered elephant in the form of some kitschy gee-gaw. What I would like to know however is where are the archaeological and heritage lobby groups insisting they take the same sort of measures to protect the world's archaeological heritage from being similarly dismembered? The MLA page on the Portable Antiquities Scheme is now supplied with a hyperlink at the bottom which says ‘A stable future for treasures from the past is at the heart of Portable Antiquities Scheme review’ but it leads at the moment to an empty page . The title is a bit ominous, as of course the PAS was set up to deal with items which do not fall under the 1996 Treasure Act. What is going on? 4. How the scheme can be funded and managed in the future in a sustainable way. Well, let us see what conclusions the working party has come to, especially on the fundamental fourth point – which looks remarkably like the PAS’ own “fifth aim” formulated in 2003 which it announced in its annual report two years ago that it had already fulfilled. Apparently not. I find the term "options for levels of activity" a bit irritating. If this Scheme is to function at all, surely it needs to do so at a "level of activity" adequate to the task of recording the finds made by as large a proportion of the British public as possible, otherwise this is information about the past which is being lost. Since at the moment, the Scheme is only reaching a fraction (though opinions differ on "how large/small" a fraction) of the British public who are finders of potentially important achaeological evidence, the only acceptable answer to the question of "levels of activity" must from a heritage management point of view be "more effective than at present".Half measures are of little help to anyone, introducing an element of bias in the record which makes the whole unreliable as a source of information about the historic environment. It merely becomes a public-relations exercise rather than a meaningful resource. Perhaps it would aid cost efectiveness if in addition to having an outreach scheme, reporting of finds - whether accidental or not - was made compulsory, as it is in many other countries (and is in the case of other sorts of things found by members of the public - such as human remains). “were not directly tied to the problems the Getty would later face over stolen antiquities. But they were not insignificant either, creating a backdrop of interpersonal drama and tensions that played out fatally when the museum faced substantive issues over acquisitions, governance, or finances. This had a pronounced impact on the functionality of the institution and its credibility within the museum world”. "exposes the self-serving humbug that too often afflicts both affluent possessors and righteous nationalists and shows that we all have a stake in getting an honest account of how great objects came to rest in our grandest museums." and private collections I would add. It remains to be seen how the archaeological aspects of looting to supply this market are dealt with. One for the Christmas present list for the in-laws maybe? For the past few months the revelations of Dennis Buggins, a furniture restorer and architectural salvage dealer based in Kent have been rocking the antique furniture world. He claims to have made a number of pieces of fake furniture which have been selling for very high prices from at least two exclusive showrooms run by brothers, one in London, one in New York (Furniture Restorer’s Allegations of Deception Shake Antiques Trade). The Sunday Times in London and The New York Times published evidence that suggested that London antiques dealer John Hobbs “known for superb English and Continental furniture, stratospheric prices and wealthy American clients”, was dealing in fakes and his London store closed in spring. Now according to the NYT (The Feud and the Fakes ), the business of equally well-connected transatlantic brother Carlton Hobbs seems likely to be going the same way. The items involved are described by a member of Sotheby’s staff as “convincingly made and with an intention to deceive. They incorporate elements that appeared to be period”. The New York Times described the affair as “deception and audacity on an extraordinary scale”. What about the antiquities trade? Dealers in antiquities trade only on their “reputations”, a nod and a wink and a handshake are the best most customers can expect when buying no-questions-asked an anonymous, unprovenanced, undocumented antiquity which he is convinced (by the seller’s “reputation”) is both authentic [not a fake] and legitmate [really and truly from a pre-1970 “old collection”, even if the dealer cannot document that]. Actually most buyers are only really bothered about the former. But fakes abound. Illicit artefacts also. The undocumented bulk of the global antiquities trade and the jealously-guarded contract of secretive silence of the trade is very effective at absorbing and concealing both. Honesty and trustworthiness and the integrity of a dealer should be the backbone of the antiquities trade, but private collectors and museums should not have to rely on the assumption that all involved in the trade are white-as-snow angels 'until proven otherwise', but rather should be able to base it on their ability to document the legitimacy of the items offered. It is on this that a reputation should be built. Without the integrity and trust from both sides, the confidence in the antiquities market from buyers would evaporate and the market could crash. And then what would have been the sense of trashing all those archaeological sites to supply it? The Nostoi exhibition of some seventy important ancient artifacts which were returned to Italy and Greece in recent years is now in the new Acropolis museum in Athens, where it will be to the end of the year. Most of them come from the Getty, the Metropolitan, and the Boston Museum of Fine Arts. Notably a significant percentage originally belonged to the Shelby White collection. What a shame that Britain as the result of a lawsuit merely managed to get a promise that the Icklingham Bronzes will return to England only when the collector dies. This was because once again the British police were unable to get the evidence together to prosecute the five metal detector users who it is alleged clandestinely dug them out of a field of Suffolk farmers John and Rosemary Browning during the winter of 1981-1982. Now its on its way out of power, and five years too late, the Bush administration has just (October 16, 2008) announced that it is putting resources into assisting Iraq in the conservation and preservation of its cultural heritage which suffered greatly under Sanctions and the US-led invasion. It has found thirteen million dollars for a programme of regeneration of Iraqi museums (good), creating a Conservation and Historic Preservation Institute in Arbil, northeast of Mosul, (good, but well away from the looted sites of southern Iraq), and a (separate?) programme to publish heretofore unpublished archaeological excavation reports prepared by Iraqi archaeologists; (good). Larry Rothfield commenting on this announcement draws attention to the fact that it completely fails to address the problem of the looting of archaeological sites to produce collectables for the antiquities market. He asks “will the Iraq Cultural Heritage Project serve as a cover for washing our hands of the problem?”. Nasty pessimist that I am, I think that will be the case. I think it will have a further effect. If Iraqi archaeology is a beneficiary of a 13 million buck handout from the US, individual archaeologists are going to be keen to work with the American administrators of these funds and might be wary of shouting too loudly about the destruction that past US measures have led to. As we know, the positions of those who ‘rock the boat’ over heritage issues is not always a comfortable one, and I can appreciate that many of my colleagues in Iraq might prefer to keep quiet when it may affect the chances of their project getting some of this money. After all, don’t you know, the State Department is at pains to emphasise (a bit further down) “Since 2003, several million dollars have been applied to [...] improved archaeological site security in Iraq”. Yeah, right. We’d all love to hear more about this please. Maybe we could have access to the satellite imagery which would show this in progress? Now let us see if the United Kingdom will make a similar offer. The Minister of Culture promised, but as I recall, all it sent in the end was a delegation to "look". Hikers in the mountains found a dead body melting out of the ice. They reported it as one tends to do on discovering human remains where they are not normally to be expected... and now want a reward, because what they found was not the remains of a victim of a modern accident but an ancient one, the Oetztal ice body ("Oetzi"). They have now received a larger reward than originally awarded (Italian law offers them 25% of the market value of the find). So what price is a corpse on the antiquities market? What is the market value of an Oetzi or any aging human remains? It may be news to some readers of this blog, but antiquity traders do sell not only items taken FROM bodies, but bits of the bodied themselves when they can get theior hands on them. A Chicago dealer had a mummified foot on offer recently - gone now, it seems qiuckly to have found a buyer. The comments made on the forums at the time were revealing of the mindset of portable antiquity collectors. There seem to be a lot of people on the portable antiquity collecting scene who, despite the relatively large amount of discussion that has been going on since 2006, and depite the fact that a lot of it is freely available on the Internet seem totally unaware of the history behind this mask. they are thus liable to be taken in by the bullish attitudes of the North American dealers who use such "won't get this from me until you prize it from my cold dead hands" type phraseology. several of them, instead of using a bit of Google have been writing to me off list to ask what is meant by the critics of this appointment. One could try Googling "Sekhemkhet pyramid", and "Zakaria Goneim" for the background. There are some good webpages on this Old Kingdom site and the excavations (a fascinating story in themselves). 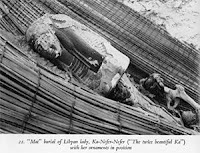 The 19th dynasty mat burial labelled "Ka Nefer Nefer" above the rubble of the demolished pyramid complex is mentioned only in passing in some of them. Googling "St Louis mummy mask" would bring up more about the subsequent history of this item once it had been divorced from its true provenance. This should throw up a couple of nice newspaper articles, including some from Egypt from which one can reconstruct the details of the controversy as it developed and then reached stalemate due to US foot-dragging. Then there are blogs, forums and websites. I recommend SAFE and SAFE Corner, David Gill's "Looting matters", Tom Cremers' "Museum Security Network" in its several incarnations and a few others (look in the list of links in my sidebar). They all have several posts on this matter and related issues. There is nothing much of any is use on any of the collectors' forums, blogs and so on. Why might that be? Two online texts in particular are very helpful. The first is a well-written and lengthy piece of investigative journalism which names names and fills in a lot of detail. This is the text of Malcolm Gay of 15 Feb. 2006 for the Riverfront Times, entitled "Out of Egypt: From a long-buried pyramid to the Saint Louis Art Museum: The mysterious voyage of the Ka-Nefer-Nefer mask"
The second text that is well worth reading (and not just for the light it sheds on this case) is a post graduate thesis available online. Laura Elizabeth Young, "A Framework for Resolution of Claims for Cultural Property" (MSc in Arts Management, University of Oregon, December 2007). Chapter 3 is a fairly detailed account of the St Louis case, and provides a few additional details about what documentation SLAM posessed at the time of purchase and what joined the files after which clarifies the sequence of events better than the account given earlier by Gay. In particular pay attention to the part played in creating a provenance by a Swiss man named Charly Mathez, who in 1997 attested that he'd seen the Ka-Nefer-Nefer at a Brussels gallery 45 years earlier, but who has - it turns out - fallible memory when asked for details. 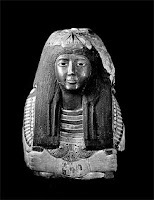 In 1952 this object was, acording to Egyptian documentation, still in the Sakkara storerooms. Then there is the Croatian connection. The mysterious 'Kaloterna (Kaliterna?) collection. A half million dollar Egyptian antiquity is stated by the Aboutaams/SLAM to have gone from a Brussels gallery to Croatia in Communist Yugoslavia in the early 1960s. Then it came into the hands of an 'anonymous' collector in Switzerland who gives a provenance of the "early sixties". This Gay discovered was a 'Zuzi Jelinek', who turns out to be a real person, Suzanna Jelinek of Zagreb in Croatia... who it seems was the Aboutaam's landlady in Geneva. A letter from her is the main piece of evidence of where the object was before the Aboutaams obtained it. Then there is the role of Sidney Goldstein, the museum's antiquities curator who initiated and oversaw the mask's purchase in 1997, Brent Benjamin only became director a year later. If Laura Young is right about what joined the SLAM files when, then it would seem they were less than open with Gay and others back in 2006 about what "due diligence" they had in fact applied at the time. All in all an interesting story. But there is no doubt about it, SLAM failed to exercise enough (in fact very little) "due diligence" (and certainly not "exemplary" as Benjamin insists) and bought something which everything shows was stolen from a museum storeroom, and even by the dodgiest of dodgy antiquity dealers' "codes of ethics" should be returned, no matter when and how it happened. Where are the retired bank managers, solicitors, local archaeology society members, teetotallers, people with good teeth, people not in combat gear, the Guardian readers and the non-BNP* voters? What other random sample of ten thousand British people would contain almost no half-intelligent, educated, decent citizens? I think he was having a bad day, but anyone who has looked over a metal detecting forum can see that there is some basis for this generalisation. This is not restricted to Britain of course. In the States, the connection between drug (meth) abuse and artefact hunting (pot and arrowhead collecting) is frequently stressed by law enforcement agencies. In many countries there are links between the antiquities trade and other criminal activities, who knows what the money supplied by eager no-questions asked collectors is going to finance? They certainly don't - and don't ask themselves. US dealers try to cast a veil of respectibility over portable antiquity collecting by suggesting it is a cultural activity practiced exclusively by and engendering home-grown polymaths. They simply ignore that large numbers of people who collect portable antiquities are not the kind of person that I would think they would like to invite to their coctail parties. But then, most of the dealers I have come across don't strike me as the sort of people I'd invite to mine. * BNP British Nationalist Party. Photo: some "lads" photographed by a roving photographer out and about in the countryside, but certainly not one of Riohard Lincoln's "detecting" snapshots. SLAM's Trustees have a fiduciary duty to the museum not to give up the piece without satisfactory proof that Egypt has proper title. Brent R. Benjamin and SLAM have shown some backbone in their dealings withEgypt. I for one appreciate President Bush appointing someone who can standup to such bullying to this important post. A comment which in the circumstances of this case, I find particularly revealing of the mindset of the US collector. Who here is being the "bully boy", the robbed or the robber? I am not sure how much of a "victory" for the pro-collecting lobby this will turn out to be. The Ka Nefer Nefer affair will not go away, and my feelings are that Benjamin's own experience as a representative of a beleagured "importer" may well be reflected in his contribution to future discussions within the CPAC. The MOUs it debates after all concern only undocumented imports. Items with proper documentation that they have passed national borders of their "source countries" are not affected, only those which have none. Perhaps instead of a weakening of resolve to clean up the US antiquities trade with more effective due diligence, the effects of having this particular person on the committee, it would be nice to think, might in fact have the opposite effect. Especially if the Egyptian government, viewing this appointment, decide to step up the pressure on St Louis to highlight the wider issues involved. David Ian in his comments on October 13th to David Gill’s post on the ongoing SLAM mask/Brent Benjamin CPAC appointment/ US foreign policy scandal (scroll down) urges us not to underestimate “the strength and tenacity of the lobbyists in Washington who want folks just like Mr. Benjamin in this position”. I for one certainly do not. I think they are very damaging to the world’s archaeological heritage, something I care very deeply about, and all too obviously, wrapped up in their own self interest, they do not. I’d say not only SLAM’s current director needs, as David Ian puts it, “a refresher on how to respect someone else's property”. Having observed these debates for a while, I've noticed that while the opponents make no bones about their complaints, the archaeological authority is curiously silent, except for a handful of people (like yourselves), who become immediate targets of attack by the opponents. Yes indeed, very nasty personal attacks and continual harassment sometimes. I see each case of this as simply indicating that the couldn't-care-less collectors and dealers have no real arguments with which to rebuff what their critics are saying. It is an admission of failure to find that mythical “common ground” they insist exists between archaeology and collecting. Are the archaeologists willing to fight as hard as the lobbyists? Well, I don’t know about North American ones, but I do know that the majority of British ones most certainly are not at all keen to look too deeply beneath the glib assurances that "all is OK" and artefact collectors are "unsung heroes of the British heritage" (sic) or stick their necks out. It would not be “politically correct” you see, but actually they are really afeared that a couple of blokes with metal detectors might get a bit "stroppy" if they say anything slightly critical too loudly. Wimps. I wonder if they give other aggressive eroders of the archaeological record the same wide berth and leeway? Developers for example. What do British "metal detectorists" get up to on their Forums? What sort of things to British metal detectorists get up to in the closed parts of their forums the reader may wonder? Well, yesterday a quick review of one of the ones I listed below, the so-called European Federation of Detectorists (aka “Sheddy’s Detecting Forum”) revealed some interesting material related to our discussion of the relationship between artefact hunting with metal detectors and the management of the archaeological resource. One thread however is more related to what David Ian said about the personal attacks archaeologists may expect to experience when the criticise the pro-collecting lobby. Nevermind asking who wants it, just print it, then no one knows who,s copied it for ulterior motives. Another concurs: “this thing is good”. Good? What is good about it that Mr Lincoln is now offering publicly to distribute my home address and phone number to all the metal detecting hoi polloi? I do not think for a minute that it will be to send my family and myself Christmas cards, or telephone me in office hours to ask advice what to do about a find they have made. I think its pretty clear from the context what sort of "ulterior motives" the metal detectorists of Britain would have in distributing amongst themselves Paul Barford's personal data. Mr “Burge” has indicated the sort of harassment of myself and my family he has in mind. Unlike the “Sheddy”s and all the rest of this pseudonymous bunch, I have never been afraid to use my real name in writing about archaeological matters (and whether or not my more diffident 'politically correct' British colleagues accept this, the effects of artefact hunting and collecting on the archaeological resource is indeed an archaeological matter par excellence). I say what I think on these matters, and do not see why I should have no reason to hide that, especially in the framework that makes "heritage heroes" and culturally-motivated connoisseurs of these people. If what I say is uncomfortable to some, let them show that my argumentation is faulty. Simple as that. For the same reason, neither has my email address been hidden from any of them. As a result over the years I have had numerous “off-list” communications signed by many artefact hunters, metal detectorists and collectors sending messages of support and saying things that they would not dare on the forums for fear of running foul of the "Sheddy"s there. Or asking questions. I always have answered these (I have three to deal with after writing this). My wife, who is not an archaeologist, does not understand why her husband, home and family life are the target of such things. “What is it you write” she asks me, “that leads people in Britain to behave this way?” Well, what indeed? This is a question the British public could be asking themselves, this is after all their past, their heritage these people are taking away and hoarding somewhere (or flogging off). Please take a look at the blog (and buy the book when it comes out). If artefact hunting and collecting are the benign and harmless pursuits of a cultured few, then there must be answers to the issues I and my colleagues raise. If there are no answers, and the only recourse these people have is this sort of behaviour, what does this mean about artefact hunting and collecting? PS. The next day Mr Richard Lincoln did indeed post up an address and phone number on at least one metal detecting forum, telling his fellow "detectorists" that this is where Paul Barford and his family live. An open invitation to carry out the threats made earlier. Many of the problems of the Bush government seem to me to stem from the poor advice the administration has received in some areas, with sometimes tragic results. With regard to Benmjamin Brent's appointment to the CPAC, we may legitimately ask how well President Bush was informed by his advisors about who he should appoint as his advisors. Did this happen by accident or Presidential design? In any case, this decision sends out a very bad signal to the international community. Regardless of how and when the 19th dynasty mummy mask now in the St Louis Art Museum (SLAM) actually left Egypt, the fact is that it was discovered on a state-funded excavation in 1952 and is documented as having gone from there to the Sakkara storerooms. Mr Benjamin claims that the Egyptian Authorities can provide "no documentation" that "it is stolen" - but they can provide documentation precisely how it came to be where they say it should be. So if we are quibbling about quality of documentation, can the US museum provide documentation showing how precisely it left that excavation and arrived in their galleries? Well, no, in fact it cannot. All it can provide now is a little unverifiable hearsay obtained from the Aboutaam brothers from whom they bought it (at least some of which now turns out to have surfaced only after the purchase). We are not talking here about something from some unknown farmers' clandestine grave robbing brought back from a rich banker's Nile cruise in the 1880s, but an artefact documented (as even SLAM admits) as having come from a state-funded excavation a few decades ago. It was recovered not by some foreign expedition working in Egypt, but an Egyptian one. This artefact incontrovertably belongs to the Egyptian people, who of course saw none of the cool half a million that this object is reputed to have cost St Louis. Once these facts became clear in 2006 (when Mr Benjamin was already in the post), the question should not have been "whether" SLAM should return it, but how best to resolve this. SLAM's foot dragging really does the image of US museums (and thus the US itself) no favours. From the comments I have seen in the web recently, I wonder how well public opinion in North America is informed about the background of this case. Some of the dealers and collectors on US-based discussion lists are coming out with some rather ignorant and misguided statements in response to Cremers well-founded anger. It was Cremers who first started the ball rolling back in 2006 and brought attention to this issue. Photo G.W.Bush (Facebook) and the 19th dynasty mask in the excavated grave during Sekhemkhet pyramid excavations at Sakkara (from M. Zakaria Goneim's 1957 "The Buried Pyramid", London). Ten thousand British "metal detectorists" are in effect helping themselves to the bits of the "pieces of the past" which they fancy from the archaeological record that is the heritage of the rest of the 62 million citizens of the United Kingdom. Some of them act responsibly, keep off what they are supposed to keep off, report what the law or their conscience tells them to report, and are generally model citizens. Others are less so. Regardless of whether they are or are not, they clearly feel the need for togetherness and tend to gather in clubs and online forums. I would not personally recommend conservation-minded members of the public venturing into a metal detecting club (I used to do this in my idealistic and ideologically more confused younger days - a most depressing experience which taught me a lot about this milieu). The online forums and media on the other hand are clearly an ideal opportunity to find out what these people are up to. One can look over the shoulder and hear the voice and opinions of "metal detectorists" and other collectors from all over Britain (or even further afield) on your desktop computer. It's worth pointing out that there is a fundamental difference in approach to openness reflected in the format of the vast majority of artefact hunters' forums in Britain and archaeological ones. In many of the latter (just to take two examples, Britarch and BAJRForum), an outsider can get direct access to the public archives (though of course they cannot post there) without being a member. The majority of British metal detecting forums on the other hand are deliberately constructed with several visible front pages containing innocuous "fluffy bunny" stuff visible to the non-member. Any real discussion of the nitty-gritty of "metal detecting" is however always firmly closed away in a hidden area which only certain people, approved by the administrators, can even see. In addition, "detectorists" write there most frequently under assumed names (a study of the names they choose for themselves is in itself very revealing). It is hard not to draw the conclusion that all this secrecy shows full well their awareness that they do indeed have much to hide from the 62 million members of the public who are not artefact collectors of portable antiquities, but whose archaeological heritage is annually being progressively eroded by the activity of this small secretive minority. The observer might ponder the reason for this secrecy and what precisely it is that "metal detectorists" cannot afford to say out in the open. What are they up to in there? Why not join one and take a look? My guess is that for many of the readers here who have not yet had the "MDForum experience", it may change their perception of the hobby and the degree to which "best practice" has been instilled in it by well over a decade of active archaeological outreach, and why best practice is failing to make more headway. A few days ago I was discussing here some recent threads on several British “metal detecting” forums. In them, individuals were admitting they had learnt of people who had found some of the Stixwourth hoard gold coins during this rally. The implication was being made that not all of them had been reported as the law of the land requires. For several reasons, this clearly needs further investigation. Some of these members of the metal detecting community potentially have information which would be able to determine whether an illegal act had been committed and if so establish some at least of the culprits. There should be no mistake here, if this is indeed what had happened during this rally, this would have been theft. 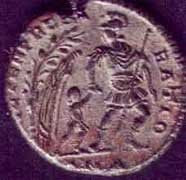 Any coins not declared as part of the hoard cannot be included in the overall valuation of the find, and the landowner (who generally receives 50% of the reward in cases like these) is cheated out of what is rightfully his – even though he had trustingly allowed this group of metal detector users onto his land as a result of which they found these precious and archaeologically significant items. Has his trust really been repaid by some of them being simply pocketed by selfish and dishonest people? One of these forums to which I posted a link was the British detectorist.co.uk forum, administered by Shane Rear. This apparently caused some considerable consternation among its members. It seems they think they should be able to shut themselves away from the rest of the world to discuss what they and other detector users are doing to the United Kingdom’s archaeological heritage without any of the other stakeholders in what happens to this finite and fragile resource even being able to look in. * This is of course not at all in accord with the social bargain embodied in the liberal policies embodied, for example, by the Portable Antiquities Scheme. What would responsible artefact hunters (the “unsung heroes of the British heritage”) have to hide? Anyway the portal of this forum cordially informs viewers interested in what “metal detectorists” do and discussing it that if they register and explore it further, they will be given a “warm welcome” among a community which is described as “active and thriving”. Perhaps all those interested in the welfare of the heritage and the realities behind what Derek Fincham writes about the “benefits” (sic) to the national heritage brought by “metal detecting” in Britain would like to register with the forum and drop in and have a look around what is being discussed there. After all, at the top it proclaims they are “Setting the standard in online metal detecting communities”. It may be unfashionably old-fashioned of me these days, but to my mind the course of action as a responsible citizen for anyone who has information that an illegal act may have been committed seems clear. For example, if someone gets a good look at and note the car registration number of a person acting suspiciously around a property which the next day they learn had been burgled. Most responsible and law-abiding people would surely make sure that this information reaches the investigating authorities, even if it turns out to be a false alarm. What excuse would they have for not passing on that information to those concerned for further investigation? I would therefore be interested to learn what steps those “online communities” (especially the one that prides itself on “setting standards”) have done in the interim to appraise the authorities and the landowner that some among them have specific information of this type and that it (together with contact details of the persons claiming to have such information) will be made available in the case that an investigation. I presume that the further continuation of the thread to which I gave a link in my previous post on this matter will fill in the story of what was done with this information. I trust that the landowner has been made fully aware that there seems some doubt whether all the coins taken from his land were reported as the law requires (who would have informed him, “detectorists”, rally organizers or the PAS?). Obviously just sweeping this matter under the carpet would only be in the interests of irresponsible “metal detectorists” and those intent on upholding the “fluffy bunny” image of “metal detecting” with which the British public is being fobbed off with. There is also the problem of how this problem can be dealt with in the eventual publication of the hoard since there seems to be reason to believe from what observers at the rally seem to be suggesting, that the means of discovery meant that only incomplete information was recovered. If this is so, this would significantly reducing the evidential value of this assemblage and obviously anyone studying this assemblage must examine these claims and make an assessment of what may have been lost from the original deposit. Since the Treasure Act (especially after the Treasure (Designation) Order 2002) is primarily concerned with protecting contextual association, what archaeological justification could there be for paying the full reward in this case? Are the finders being rewarded for recovering some more “gold” and doing what the law anyway obliges them to do, or being thanked for supplying reliable archaeological information for us all? What is the state buying from them and why? Here the provisos of the Code of Practice of the Treasure Act (points 79 (iii –v and ix) and 80) should be borne in mind. This might be enough to convince British “metal detectorists” in future to ensure responsible standards are upheld by all finders of a group of objects that fall under this Act. It seems clear that there are many questions around the application of the Treasure Act that seem worth exploring further with reference to artefact hunting and portable antiquity collection and trade in general. This is a strange one, I cannot quite work it out. This You Tube video "Great Findings in Holland" posted by a Mark Herman seems to be a re-posting of a film a colleague drew my attention to a while back. It must have been withdrawn and reposted. At first sight it would seem to show a rather large personal collection of splendid archaeological artefacts . 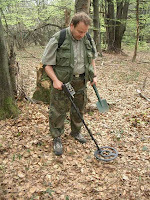 This is what the author of the film says it is: "Enjoy my Great Discovery`s (sic) with my metal detector in Holland !!" But look again. To my eye there are four groups of objects here. There are things which may be genuine archaeological finds, though who knows where from, they could be from Holland, they don't have to be. There are things which are certainly bizarre 'out of place' artefacts (most obviously a "Greek fibula and a what looks like a Shang bronze vessel ...) unlikely to turn up in metal detecting in Holland. There are Byzantine pectoral crosses and Pannonian brooches and belt fittings. And then there is a large number of items which are of a type sold by Bulgarian artefact dealers on a certain well-known internet auction site as "authentic [freshly looted in] the Balkans", but which are in fact fakes, some clever, some atrociuously bad. Spot the patinated metal casts of... plastic toy soldiers (!) at the beginning of the film (41-43 seconds). These are all types well known to the artefact collecting fraternity, there is an online gallery of them on the Yahoo AncientArtifacts forum (you have to register to see it). Once you know what they look like they can be spotted a mile off. The fourth group are objects which its impossible to say from the video whether they are authentically ancient artefacts or not (I have my doubts about some of the ironwork for example). So what is going on? Perhaps somebody who has bought a lot of things on eBay wants to show off their collection and for some personal reason wants to pretend that like a homegrown Indiana Jones they found it all in Holland of all places. Perhaps somebody who wants to start dealing in these artefacts has put up a video attempting to give them a false provenience as having come from recent metal detecting in Holland. I don't know, its a very odd video, showing objects that in my opinion cannot be from archaeological sites in the place which the "finder" claims he found them. This collection once again raises a whole bunch of questions about the private collecting of and the market in archaeological artefacts of undocumented origins. A few days ago there was discussion of Derek Fincham’s article "A Coordinated Legal and Policy Approach to Undiscovered Antiquities: Adapting the Cultural Heritage Policy of England and Wales to Other Nations of Origin" 15 Int'l. J. Cult. Prop. 347 (2008). The abstract appeared first, and among those discussing the reactions of portable antiquities collectors to it, the author singles out for criticism points I initially made about the collectors’ enthusiasm: “Sadly I'm afraid some already have reacted without even reading the piece”. At the time however that the initial reactions were coming in from the collectors, the full article itself was not available to any of us – collectors included. I was not convinced by the author’s arguments and position, but the writer correctly pointed out that “those interested in the scheme and archaeology [should] do me and the employees of the PAS the courtesy of reading the piece before dismissing my position”. True enough. I have since had a chance to read the full text, and congratulate the author on an abstract that adequately reflects the content of the article. Having read the text in full, I find it does not really say anything much about the author’s basic premise than the abstract did not. I remain to be convinced by the author’s arguments. Below I set out why. The purpose of the text is not entirely clear, nor to whom it is addressed. I find the core idea somewhat difficult to grasp. Fincham writes (p. 348)"the market may find a tenable compromise by shifting its focus to the cultural property and legal framework in England and Wales". But cultural policies and legal frameworks are not established by “the market” in portable antiquities. Neither should they be. The market in portable antiquities is global, and largely outside the law, how is it to shift its focus (whatever that means) to affect the cultural policy and legislation of the several dozen major "countries of origin" of the antiquities it handles? The author does not enlighten us. The author seems to totally misapprehend why many states declare archaeological remains state property – it is not to “prevent looting” (p. 349, 351). Take Scotland (and Northern Ireland) for example. The imprecise term “looting” derives from (the act of disregard of) that legal framework and is not the reason for its creation which is far more complex. Nowhere do we find in Mr Fincham's text a definition of what he means by "looting". The same goes for the author’s treatment (p 349, 351) of export licencing. His statement (p. 351) "these two regulatory strategies are not focused at (sic) the real core of the problem: the looting of archaeological sites. Both are imperfect responses to damage that has already taken place" is therefore incomprehensible. Equally incomprehensible to me is that this paragon of cultural heritage policy (the PAS) is the “underlying assumption that merely relying on law enforcement strategies and protection of sites will not produce the desired results”. It is very difficult for me to discern in Fincham’s text what these “desired results” would be if not the protection of archaeological sites. I found the text dreadfully muddled and it could have done with closer editing. In places – particularly in the first part of the text (and like many discussions of this type) - the author fails to properly differentiate the terms "United Kingdom" from England and Wales. Admittedly he does include (pp 361-3) a valuable discussion of Scotland (though the nuances of the legislation seem to escape him), but Northern Ireland is omitted from the discussion. Suddenly he starts discussing the US (p. 355) before switching back to the UK. There is some doubt however whether the author really grasps the workings of the English and Welsh legislation, for example mentions of a “designated” coroner (p. 352). Neither is he up to date (p. 349) on the restrictions on metal detector use within the various parts of the UK (National Trust, SSSIs, the various DEFRA schemes). I feel the uninformed reader is likely to be misled by Fincham’s fragmentary discussion of the heritage legislation (pp. 353-5) which might give them the impression that Scheduled sites are Guardianship sites (and makes no mention of other forms of protection). Obviously this is not very helpful to the foreign collector trying to imagine how the British systems work. It also does not inspire much confidence in an author which is holding his vision of this legislation up as a model to be followed. We are told that Fincham primarily "wanted to write what I hope is a thoughtful piece which describes in an objective way what the PAS does." What it actually does is to regurgitate the same old stuff being produced by the ream by the PAS itself. Fincham presents generally known things that can be garnered from their annual reports, some of it seems almost as if copied word for word from some of them. The author has obviously not gone beneath the layer of 'spin', inherent in what a stop-go funded ad hoc organization having annually to justify its very existence to cost-cut seeking bureaucrats feels it has to produce. The main body of the text (pp 355-361) is merely a presentation of the “achievements” of the PAS which merely repeats the information already freely available in other sources. Instead of being particularly “thoughtful” in his use of this material, Fincham has swallowed all the spin. For example both PAS and Fincham praise PAS successes in getting Treasure cases reported. The same graphs are used (Fincham Fig 1 under “benefits of the PAS”). In neither case is it mentioned that the definition of what is Treasure changed twice (1996/7, 2003) in the period covered by the graph, and the two peaks on the graph correspond to those changes in definition. The reporting of Treasure however is not handled by the PAS but an independent unit with its own staff in the BM. One is surprised to read (p. 355) that the PAS allegedly represents a policy that: “sharply contrasts with the context-focused narrative found in most culture heritage scholarship”. This gives a totally false impression of the PAS and its aims… It is all about context of the finds in its database. That’s what the database records. Likewise I am astounded to read that the PAS incorporates “the public’s interest in ancient objects and a potential reward” (p. 355). The PAS does not reward finders, neither financially or by any other means, they report to the PAS non-Treasure finds through public spirited attitudes and as Fincham says, out of interest. No money changes hands. We are presented with a series of glib spin-statements which are nowhere backed up – such as the policies in England and Wales coupled with the PAS “leads to less looting of important archaeological sites” (p. 349). I really do not see how Fincham can say this. Where did he get the figures to substantiate this statement – presented as fact? (“Less” than what?) We also note the word "important" - how is that measured? I discussed Stixwould here a few days ago - let us note the reason why an excavation here was deemed necessary in September this year. The final section is called: “can or should other nations adopt a similar scheme?”. Here we would expect to find the nitty gritty of a concrete proposal…. Fincham (p. 363) thinks that “at least two aspects of the cultural policy in England and Wales can and should be widely adopted: rewarding the finders of true chance finds and a community outreach program that educates the public about good practice and the importance of heritage and context”. Well, first of all, it is not true to say that in none of the nations “in Europe, Asia, Central and South America, or the Middle East” give chance finders of archaeological objects a reward for reporting them. This is a common mantra of the collecting community, but when asked to create a database of these “retentive” and “unfair” laws, they refuse. I suspect there is a fair amount of exaggeration here. I’d like to see the evidence set out properly for such generalizations. Which legislations reward and how much in what circumstances, and which do not and why. Secondly in England and Wales, by no means are all reporting finders rewarded for the information they give. The vast majority are not. In Scotland where there is a far wider range of things reportable, the majority are. So I am at a loss why Fincham holds up the English and not the Scottish system as the more suitable for emulation from this point of view. If the English Treasure Act were applied in Egypt, the finder of an ostracon describing the building of the tomb of Seti I, the eye of a statue of Amenhotep III or shabti of Nefer-Nefer-Ka would not get a reward. Dr Fincham wants people to be financially rewarded for obeying their country’s laws. Let us note that the only real reason for this is if they do not, there are plenty of dealers outside the country that would be willing to buy artefacts from finders no-questions-asked. In a country where artefacts are state property, there can be no legal market in them, only an illegal one. Fincham in proposing all countries must introduce a reward system is basically saying that the legal framework of ownership should be changed to allow a free-for-all and a legalisation of the market everywhere. Such legislative changes however would have a knock-on effect going well beyond the market (as for example, organization of conservation work, excavations, museum accessions etc). I wonder whether Fincham has thought all of them through in the light of the various national systems? Fincham says “policies like the PAS are easy to change and adapt to a given archaeological resource”… Well, are they? Surely they are embedded in (and a response to) a particular configuration of social and other factors. Given, however, that the core of the PAS as Fincham presents it is “community outreach program that educates the public about good practice and the importance of heritage and context”, then do not many nations in fact already have such institutions? They are called state archaeological services, they often have regional inspectorates/offices, and are supplemented by museums. It is to these bodies that finders are asked or required to report finds. Often by law. One thing Fincham totally ignores is that almost all of the PAS FLOs in England and Wales are embedded in the pre-existing museums identification service and existing county or regional archaeological units. I’d like to see Fincham (or the PAS) actually state what it is they do differently in terms of outreach that is not being done by archaeologists all over the world already. The PAS is merely an intensification of scale of the activities being carried out by museums for decades. The work of the PAS equally could be done by museums and archaeological bodies without the PAS, perhaps with a co-ordinating office within the structure of the MLA (for example in more central Birmingham). The second factor which Fincham omits is the very real relationship between PAS data gathering and metal detecting clubs and rallies. Without them, the PAS database would be numerically thinner (significantly, PAS figures are lacking which would inform us by how much). To set up an imitation of the PAS in Iraq or Egypt, you’d first have to set up metal detecting clubs and rallies there. The all important factor is the social setting of the PAS, which is lacking in many other “source” countries. I’d like to ask whether Fincham would advocate introduction of a PAS system with attendant liberalization of the laws on state claims to archaeological material for neighbouring Scotland or Northern Ireland and whether he thinks that would be a forward or backward step, and in what respects. I am not at all convinced that setting up metal detecting (or tomb-robbing) clubs in Iraq or Egypt or Guatamala so that a PAS-clone can gather “information” (of what type?) from them would really be an archaeologically-positive move.